Poinsettias around Christmas will grace your sanctuary and helps beautify the church. Also they can help raise lots of monies for your special Christmas events and/or fundraisers for special causes. Many churches make these poinsettias available for purchase and place in memory, in honor of or in thanksgiving for a loved one or anyone you choose. They usually have them available for $10.00 each and have you fill out a form similar to one of the poinsettia donation forms below. Churches will normally let you purchase the poinsettia or just simply give a donation toward your special cause.They will then have a poinsettia church bulletin insert similar to the one below so everyone can see who purchased a poinsettia and in whose name they were in memory or honor of. Many churches will also normally let you take your poinsettia home with you after the holidays are over or after the Christmas day service is over. Reminder: "Please return this form to the church office by [Day of the Week], [Date] so that your dedication is included in the order of worship for the [Church Event Name] on [Date of Event]. Please make your check payable to [Church Name] and designate in the memo section “Christmas Poinsettia”. It is important that you PRINT your dedication CLEARLY in order to avoid errors. The poinsettias will adorn the sanctuary beginning December [date] for the [Church Event Name] and may be picked up following the Christmas Eve Service"
Note: Please note: One person, couple, family or group per numbered line. $10.00 per Poinsettia/Dedication Line. "Thank you, thank you very much to everyone who donated to the [Church Name] Poinsettia Fundraiser. We want to thank them for carrying on the [Church Name] tradition of generosity. 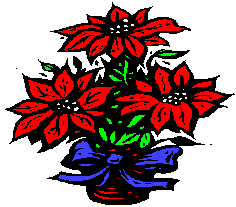 The [Church Name] Poinsettia Fundraiser benefits the [Ministry…]. Your name will be posted on this list if you donate to this fundraiser and inserted in the Christmas Church Bulletin. Thank you again"
Return to Printable Christmas Activities from Christmas Poinsettia Donation Forms and More.